"Capital creates wealth, wealth creates change, wealth creates communities, if we lack wealth -we can't realistically expect to have any of these." According to an article on ABC news. Blacks were 35% less likely to invest compared to whites. This is not surprising seeing as it has been reported in several studies including a 2007 study by Pew Research Center that the median net worth for black was under 20,000. The Pew Research Center study is represented in the graph below. 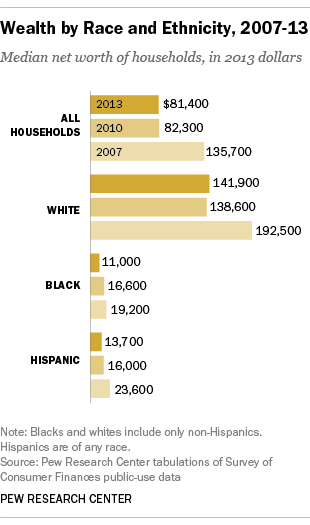 It states the median net worth for Black households has declined since 2007. In 2007 Whites median net worth per household was almost $193,000 while Black households were just under $20,000! Our goals are to provide a medium for black people to increase income streams, ownership, and investments. Our wealth is an important factor in developing our communities and having ownership stakes. Without wealth we cannot invest to create more wealth. This section is designed to help us develop our wealth, become investors, entrepreneurs, and owners. Help our community grow - buy from these companies.